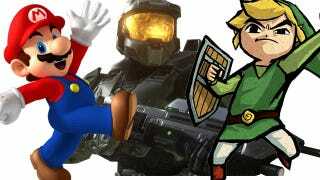 Are These The Top 50 Video Game Characters Of All Time? Guinness asked gamers to vote for the top 50 video game characters of all time, so if your favorite character is not represented in this list you probably should have voted harder. More than 13,000 gamers cast their vote at the Guinness World Records Gamer's Edition website in order to create this list, and it ended up pretty much as one would have expected. Mario, Link, and Master Chief top the rankings, with very few surprises popping up in the remaining 47. I would not have expected Eddie Riggs from Brutal Legend to make the list, for instance, and Naruto doesn't seem like he should count. Nintendo's penchant for creating memorable characters shines through, with 11 entries coming from the house that Mario built. Of course Luigi is not one of those 11. Everyone hates Luigi. Check out the full list below to see if your favorites made the cut.